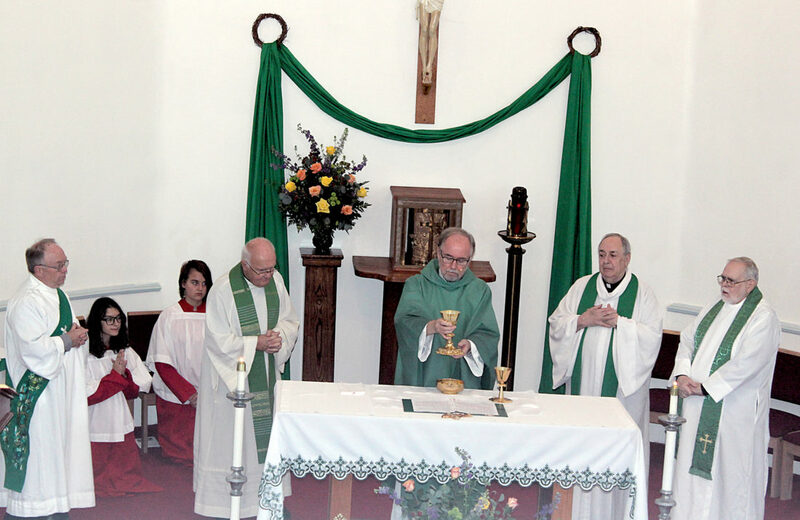 Submitted photos by Lynne Llewellyn Parishioners and guests of St. Patrick Church in Coalton commemorated the occasion of the 100th anniversary of the establishment of St. Patrick Church as a parish on Oct. 28. 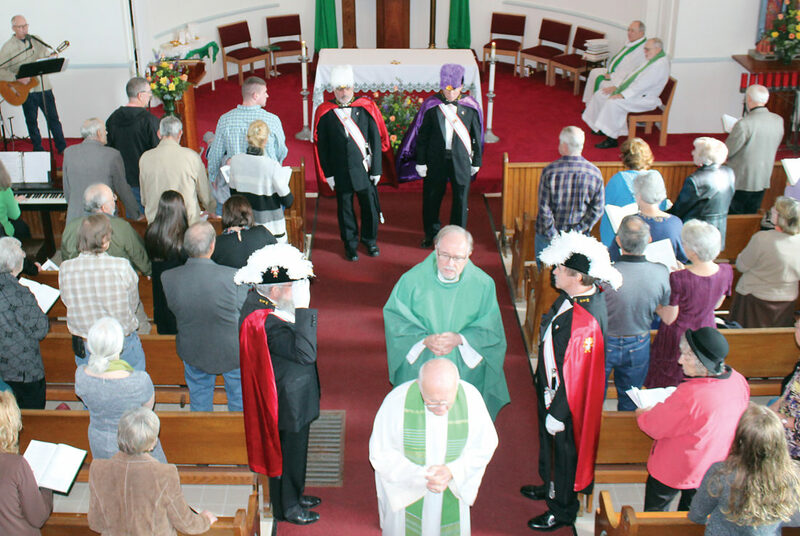 COALTON — Parishioners and guests of St. Patrick Church in Coalton commemorated the occasion of the 100th anniversary of the establishment of St. Patrick Church as a parish on Oct. 28. The event was attended with a “packed house” at the 2 p.m. Mass with Fr. Jim O’Connor, Fr. Giles LaVaseur, Fr. Jim McCafferty, Fr. John Dibacco and Msgr. Jeremiah McSweeney co-celebrating, along with Deacon Ray Godwin assisting. The Knights of Columbus Honor Guard, dressed in full regalia, gave a special air of reverence to the Liturgy. Making the Mass complete, was the wonderful music, liturgical ministers and beautiful decorations. Following the Mass, a special, catered dinner was served in the parish hall. Like the church, the parish hall was beautifully decorated, as friends and family gathered to enjoy an afternoon of fellowship, fun and food. The event was attended with a ‘packed house’ at the 2 p.m. Mass with Fr. Jim O’Connor, Fr. Giles LaVaseur, Fr. Jim McCafferty, Fr. John Dibacco and Msgr. Jeremiah McSweeney co-celebrating, along with Deacon Ray Godwin assisting. Concluding the dinner, Fr. Jim gave a brief history of the parish, which included the names of the 27 priests who have served St. Patrick’s over the more than 100 years. The ethnic demographics of the community began with Irish, Italian immigrants that grew into the multi-ethnic population of today, maintaining the fabric of their roots. The Knights of Columbus Honor Guard, dressed in full regalia, gave a special air of reverence to the Liturgy. Making the Mass complete was the wonderful music, liturgical ministers and beautiful decorations.